How Far is KGEYES Samyuktha? KGEYES SAMYUKTHA is a first-of-its-kind residential complex coming up at Madambakkam, near Tambaram. Situated amidst many professional educational institutions and SEZs like MEPZ & Shriram IT Park, it offers the best value-packed homes at an affordable price. 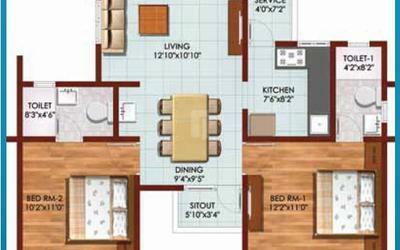 Coming in 2 BHK & 3 BHK sizes, the amenities planned inside the complex are something worth boasting of. Outer lines with P.V.C. (Finolex / Varun / equivalent) and internal concealed piping will be CPVC / equivalent All closets and wash basins will be provided in Parryware / Roca / equivalent All C.P. fittings will be of Parryware / Roca / Equivalent Master bedroom toilet will have EWC closet, wash basin and Diverter with provision for geyser Common toilet will have IWC closet, wash basin and Diverter with provision for geyser Washing machine point will be provided. KGEYES Philosophy is “To Redefine Comfort” by building quality homes in Chennai City and its immediate surroundings for your luxurious living. By being transparent, open, committed and yet friendly to the customer we strive to build a long-term relationship with the society at large. In about 2 decades of being in business we are already considered a trust-worthy builder in Chennai.KGEYES Residency has already delivered many premium and hi-end residential apartments in Chennai City. Each and every customer of KGEYES has seen their investment in a KGEYES Flat grow multi-fold. Resulting in better value-for-money.ISO 9001:2008 Certification: Whether it is customers, business partner or vendors, KGEYES name evokes a sense of pride in them. KGEYES does not want to rest on its laurels. The company fully believes that the process is continuous. This drives the entire organization to set new goals after achieving one. For example, the company went onto obtain the coveted ISO 9001:2008 certification in a record time. Add to that the procedures and processes being followed rigorously by all departments concerned to keep the customers happy. KGEYES Residency also believes in adapting itself quickly to changing needs of consumers. KGEYES realized that today’s consumers are socially more conscious about preserving Mother Nature. Swiftly, KGEYES became the first company to obtain the Gold rated Green Homes certification from Indian Green Building Council for its prestigious condominium project ‘KGEYES Eternity’. Many future projects will also get such certification. KGEYES strives to provide the best designs to customers, in terms of maximum space utilization, increased ventilation and lighting, and modern, yet comfortable living spaces.